The brutal crisis in the Central African Republic has gone on largely unnoticed internationally except, maybe, for this one iconic image: a sea of displaced people huddled in the hulls of abandoned, rusty planes. This was Mpoko international airport, in the capital Bangui. At its peak, 100,000 people lived in this camp. Three years later however, bulldozers came and went, and most of the 20,000 people still living in Mpoko have returned to where they came from. But this closure still matters. The closure of Mpoko is good news: it’s a sign of stabilization in the Central African Republic, a country where even the oldest citizens cannot remember more than very brief periods of relative stability. But this closure remains largely symbolic. The displaced people have little to return to: precarious safety, poor to non-existent infrastructure, destroyed houses still riddled with bullets, and 150 euros in cash for families of six to re-start their lives from scratch. Country wide, one in four people are still displaced, either inside or outside of national borders. The camps’ closure has officially been a priority for close to three years. For example in September 2015, after a year of relative calm in Bangui, the camp’s population had dwindled to 6,000 people and Médecins Sans Frontières was preparing to close its hospital and clinics. 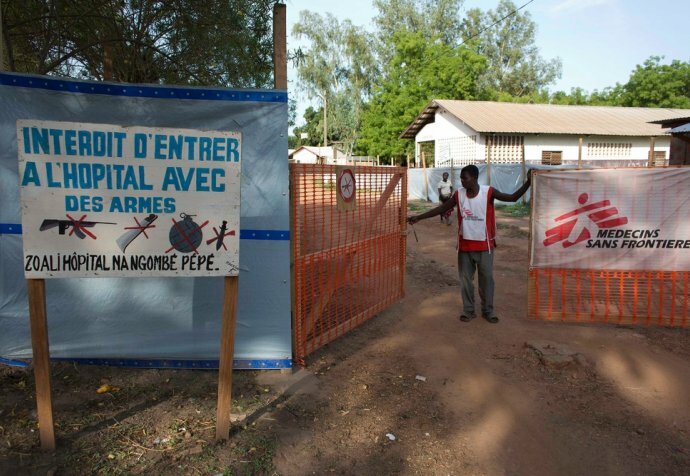 But just a few days before the scheduled reduction of Médecins Sans Frontières activities, the conflict flared up. Yet again, thousands ran to the relative safety of the airport, and our hospital was flooded with people: the number of consultations rose from 250 to 400 a day. So whilst there is some cause for cautious optimism, what the history of Mpoko camp tells us for certain, is that tomorrow is uncertain in the Central African Republic. The Central African conflict that caused the camp to spring to life in the first place reached horrifying levels of violence, with atrocities committed by both sides. Médecins Sans Frontières' teams, who started providing medical support in Mpoko just one day after the first families arrived, witnessed horrendous acts such as dismemberments. For three years, families did their utmost to maintain a minimum of dignity despite everything; 5,807 babies were born in Médecins Sans Frontières' field hospital of Mpoko. Moreover, the presence of the camp provided some services even beyond the displaced people living there. At the time of the camp’s closure, two thirds of our patients were coming from outside of the camp; some were walking for hours to reach the hospital because there were no other free and reliable medical services accessible to them. On December 4th 2013 the UN security council, and, a few hours later, France separately, vowed to take action to stop what was already intolerable levels of violence during the wave of conflict that had started in 2012. One day later, Bangui, where some fighting were already taking place, fell into all-out war and the first people fled to Mpoko, seeking protection from the UN and French troops based at the airport. Outside the mobilization of military resources however, the Central African Republic remains at the bottom of international priorities. Despite the huge, glaring needs of a population in distress, there is not much appetite to provide basic services in such a dangerous and tense environment. For three years, except for Médecins Sans Frontières' permanent medical presence there was little services in the camp and Mpoko was mostly a squalid place to live. Mpoko and indeed the Central African Republic never saw the mobilization of international aid at levels similar to other displaced people or refugee camps in the world. Squalid, yes; forgotten, yes; but still – Mpoko camp was the entry point for the coverage of the terrible humanitarian crisis in the Central African Republic. The displaced people lived right along the tarmac of the landlocked country’s international airport. It was, quite literally, the first thing you saw when you arrived in CAR. For visiting reporters and their readers around the world, Mpoko became the image of underreported CAR. Today, Mpoko has closed. The symbol of the huge needs of the Central African people has disappeared, but not the country’s problems. Mpoko was a special project for Médecins Sans Frontières. All teams still remember the extraordinary challenge of building a full 60-bed field hospital in a matter of a few days, on a piece land where there was nothing, and at the peak of an extraordinarily brutal conflict. Our teams worked there every day, for a thousand days – international professionals alongside our courageous national staff. All our Central African Colleagues had suffered with their loved ones the worst of the conflict, some of them even living in the displaced persons camp as they had lost everything. Together they provided 440,000 consultations, 46,000 medical interventions in the emergency room, and 11,000 hospitalizations in the temporary structure of wooden planks and tarpaulin. All this was made possible by the donations from private donors all over the world who support Médecins Sans Frontières.